Arthur William Hammans was born on the 31st of August 1846 and arrived at the school in September 1860. Two years after finishing school, Arthur enlisted as Ensign in the 32nd (Cornwall) Regiment of Foot on the 18th December 1866. He rose to Lieutenant in September 1869, became Captain when the regiment was merged into the Duke of Cornwall’s Light Infantry in 1881, and was promoted again to Major in 1887. On 23 Oct 1889 Arthur married Mary Josephine Wagner, who was the eldest daughter of John Wagner, of St. Kilda, Melbourne, Australia. He was serving in Burma in 1892 when their first son, Arthur John Spencer was born on Neilghenny Hill, India. Their second son, Alexander William, was born in 1895 in London, a year after Arthur had retired from active service. According to the census records, the family was still based in London in 1911. Both sons had followed in their father’s footsteps and were serving with the Duke of Cornwall’s Light Infantry upon the outbreak of war. The elder son, by then Major Arthur John Spencer Hammans, served at the front with the 1st Battalion from the beginning. He was awarded the Military Cross on 10th March 1915 “for gallantry and coolness on 16 December 1914 after filling in a trench 100 yards from the enemy during which he spent three hours under heavy fire.” The younger son, Alexander William, had also been serving in the 1st Battalion at the outbreak of war, but was transferred to the 6th, which was stationed at home, where he was responsible for training new recruits. 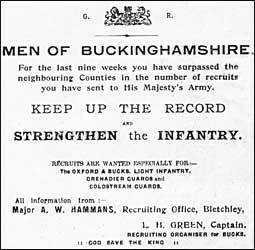 Not to be outdone by his boys, Arthur William was re-employed by the army as Recruiting Officer at the new official recruitment station that was set up in June 1915 in the back yard of The Park Hotel, Bletchley. But disaster struck the family in July 1915, when Alexander William was seriously injured. He had been out in France training 60 bomb throwers. On his first day in the trenches, he was testing a new type of bomb — which exploded unexpectedly, blowing off Alexander’s right hand and injuring both of his legs. Arthur left Bletchley to join his son in France. However, when Alexander began to recover, Arthur returned to his recruiting work after only five days. The job was intense, and made more stressful when a fire broke out at the Recruiting Office in December 1915. At the age of 71, after a year of this work, Arthur suddenly fell ill and died on 13th June 1916. Arthur William Hammans was remembered for his “kindly presence and unfailing courtesy”. He was given a military funeral and was buried in the parish churchyard of Goring, where eight buglers of his former regiment sounded the Last Post. Only Alexander survived the war; he married Catherine V.A. McCullock in London in 1920. Arthur John Spencer, who had also been awarded Elder Legion of Honour by the President of the French Republic, was killed in action on 3rd July 1917. This entry was posted in The Fallen and tagged 32nd (Cornwall) Regiment of Foot, Bletchley, The Park Hotel. Bookmark the permalink. Many thanks for your close attention! We have amended this so that the date is now correct.